Tyler Cravy is used to sneaking up on people. In fact, the Huntsville right-hander's baseball journey has been all about seemingly coming out of nowhere. The Southern League's top pitcher with a 7-1 record thought his career on the diamond was over after high school and apparently wasn't all that concerned about it. "I hadn't really planned to play baseball," said Cravy, who spent his freshman year solely as a student in his native California. But that changed after he transferred community colleges and got back on the mound. He set a Napa Valley school record with 110 strikeouts in 90 1/3 innings and had the baseball bug again. Cravy was the Most Valuable Player in the Bay Valley Conference and received All-American recognition. Milwaukee took interest, selecting him in the 17th round of the 2009 Draft. Then Cravy fell off the baseball radar again, spending most of five seasons without getting any traction in his career. "It was an uphill battle," he said. Thing began to change late last season, though. With Brevard County short of starters, Cravy was moved out of the bullpen and flourished for the first time in the Minors. He posted a 1.29 ERA in nine Florida State League starts and was recognized as the Brewers' Minor League Pitcher of the Month for August. Cravy was rewarded with a spot in the Arizona Fall League. The 24-year-old was back in the bullpen but posted a 2.76 ERA as the Surprise Saguaros won the AFL title. 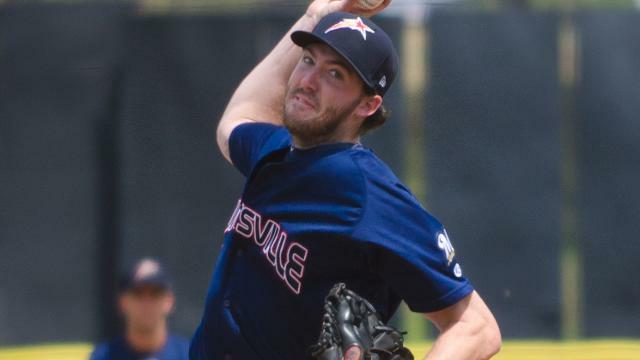 The Brewers wanted to give Cravy another shot in the rotation, but they didn't have a spot at Huntsville to start the season. That changed, though, after Andy Moye had to go on the disabled list. Cravy took a loss in his first start but then went on a roll. While winning six straight outings, Cravy allowed just four runs and 18 hits over 34 innings. For the season, he had a 1.87 overall ERA to go with his 7-1 record and had 42 strikeouts to eight walks in 43 1/3 innings. Opponents were batting .170 and he had a WHIP of 0.78. It was impossible to overlook Cravy anymore. "I pitch best when I'm challenged," he said. A sinker-slider-type pitcher, Cravy still may find his best route to Milwaukee out of the bullpen. "I've done both my entire career, so I'm comfortable in either role," he said. "But I enjoy starting." Cravy said it isn't hard adjusting and that he doesn't change much. "In the bullpen, I'm fastball, slider, cutter," he said. "As a starter, I add a changeup and two-seamer." That repertoire has certainly worked. The impressive Huntsville rotation includes the Brewers prospects ranked No. 8 (Taylor Jungmann) and No. 16 (Drew Gagnon) as well as a Harvard graduate (Brent Sutter). But it's a former community college baseball dropout who has shined the brightest so far. Moving on up: The Southern League lost two of its top hitters when Birmingham second baseman Micah Johnson, the Chicago White Sox's No. 3 prospect, and Pensacola outfielder Donald Lutz were promoted to Triple-A. Johnson, 23, was hitting .329 with a .441 on-base percentage and 10 stolen bases when moved up to Charlotte after playing 37 games. Lutz, 25, was advanced by Cincinnati to Louisville, also of the International League, after batting .360 in 23 games. He had six homers, 16 RBIs and an OPS of 1.068. On the shelf: Montgomery second baseman Ryan Brett, Tampa Bay's No. 8 prospect, was sidelined after hurting a shoulder in a play at the plate against Mississippi on May 13. He was hitting .321 in 35 games, going 5-for-5 in an April contest. Brett, 22, batted .340 in 51 games for Charlotte of the Class A Advanced Florida State League last year but dropped to .238 in 25 games after being promoted to Double-A. He began 2013 completing a 50-game suspension. Trouble at home: Mississippi catcher Braeden Schlehuber loves the road, where he hit .448 (13-for-29) with two homers and five RBIs in his first nine games. Playing at home, though, was a different story. Schlehuber was hitless in his first 30 at-bats in Mississippi. He did get three hits in his next three games, but his home average was .077 (3-for-39) through May 18. That gave him an overall mark of .235. Schlehuber, 26, was a fourth-round pick by Atlanta in the 2008 Draft.